In my previous blog post I used, without proof, the fact that the initial algebra of the functor is a free monoid. The proof of this statement is not at all trivial and, frankly, I would never have been able to work it out by myself. I was lucky enough to get help from a mathematician, Alex Campbell, who sent me the proof he extracted from the paper by G. M. Kelly (see Bibliography). I worked my way through this proof, filling some of the steps that might have been obvious to a mathematician, but not to an outsider. 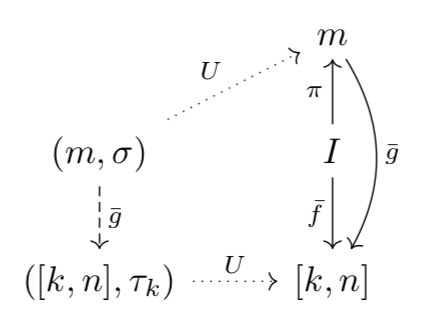 I even learned how to draw diagrams using the TikZ package for LaTeX. What I realized was that category theorists have developed a unique language to manipulate mathematical formulas: the language of 2-dimensional diagrams. For a programmer interested in languages this is a fascinating topic. We are used to working with grammars that essentially deal with string substitutions. Although diagrams can be serialized—TikZ lets you do it—you can’t really operate on diagrams without laying them out on a page. The most common operation—diagram pasting—involves combining two or more diagrams along common edges. I am amazed that, to my knowledge, there is no tool to mechanize this process. In this post you’ll also see lots of examples of using the same diagram shape (the free-construction diagram, or the algebra-morphism diagram), substituting new expressions for some of the nodes and edges. Not all substitutions are valid and I’m sure one could develop some kind of type system to verify their correctness. Because of proliferation of diagrams, this blog post started growing out of proportion, so I decided to split it into two parts. If you are serious about studying this proof, I strongly suggest you download (or even print out) the PDF version of this blog. I used the fact that is the unit of the tensor product, the associativity of (all up to isomorphism), and the distributivity of tensor product over coproduct. the second of which may, in itself, be considered an algebra for the product functor . Following our intuition about lists, this multiplication corresponds to list concatenation. One way of concatenating two lists is to keep multiplying the second list by elements taken from the first list. This operation is described by the application of our product functor . Such repetitive application of a functor is described by a free algebra. There is just one tricky part: when concatenating two lists, we have to disassemble the left list starting from the tail (alternatively, we could disassemble the right list from the head, but then we’d have to append elements to the tail of the left list, which is the same problem). And here’s the ingenious idea: you disassemble the left list from the head, but instead of applying the elements directly to the right list, you turn them into functions that prepend an element. In other words you convert a list of elements into a (reversed) list of functions. Then you apply this list of functions to the right list one by one. The internal hom can also be defined using a universal construction, see Fig. 1. The morphism corresponds to the counit of the adjunction (although the universal construction is more general than the adjunction). Fig. 1. Universal construction of the internal hom . For any object and a morphism there is a unique morphism (the curried version of ) which makes the triangle commute. The hard part of the proof is to show that the initial algebra produces a free monoid, which is a free object in the category of monoids. I’ll start by defining the notion of a free object. You might be familiar with the definition of a free construction as the left adjoint to the forgetful functor. Fig 2 illustrates the essence of such an adjunction. Unfortunately, this description doesn’t quite work for some important cases, like free monads. In the case of free monads, the right category is the category of endofunctors, and the left category is the category of monads. Because of size issues, not every endofunctor on the right generates a free monad on the left. It turns out that there is a weaker definition of a free object that doesn’t require a full blown adjunction; and which reduces to it, when the adjunction can be defined globally. 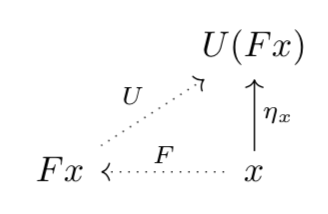 Let’s start with the object on the right, and try to define the corresponding free object on the left (by abuse of notation I will call this object , even if there is no functor ). For our definition, we need a condition that would work universally for any object , and any morphism from to . where is the identity functor (see Fig. 3). In the absence of an adjunction, we’ll make the existence of the morphism part of the definition of the free object. The diagram in Fig. 4 illustrates this definition. 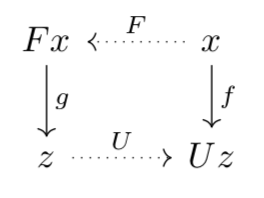 It is essentially a composition of the two previous diagrams, except that we don’t require the existence of a global mapping, let alone a functor, . is called the universal condition, because it works universally for every and . We say that is induced by the morphism . is often easier because it lets you work in the simpler, underlying category. For every , -algebras form a category; and there is a forgetful functor that maps an -algebra to its carrier object . We can therefore define a free algebra as a free object in the category of -algebras, which may or may not be generalizable to a full-blown free/forgetful adjunction. Fig. 5 shows the universal condition that defines such a free algebra generated by an object . 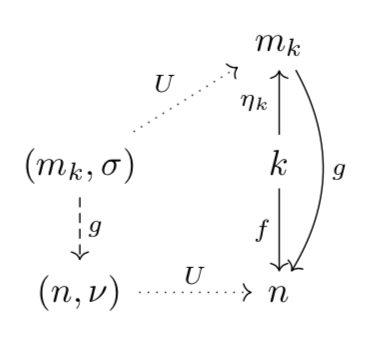 We use a notational convenience: is the lifting of the morphism by the product functor . This might be confusing at first, because it looks like we are multiplying an object by a morphism . 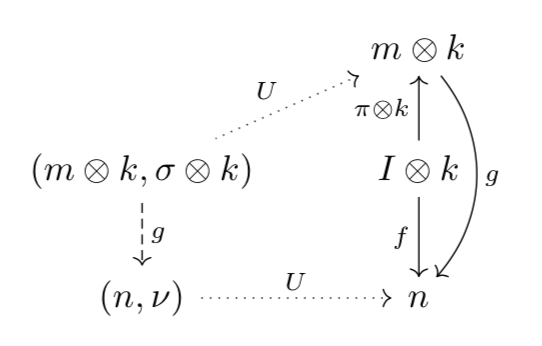 One way to parse it is to consider that, if we keep the first argument to the tensor product constant, then it’s a functor in the second component, symbolically . Since it’s a functor, we can use it to lift a morphism , which can be notated as . 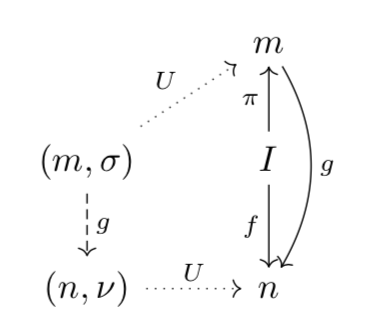 Alternatively, we can exploit the fact that tensor product is a bifunctor, and therefore it may lift a pair of morphism, as in ; and is just a shorthand notation for this. Bifunctoriality also means that the tensor product preserves composition and identity in both arguments. We’ll use these facts extensively later, especially as the basis for string diagrams. Fig. 8. 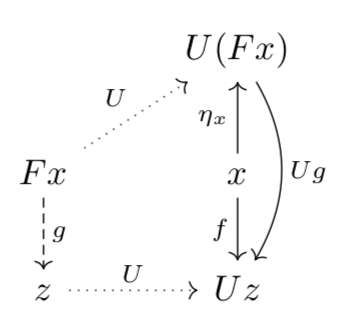 Initiality of the algebra for the functor . Here, and are the two injections into the coproduct. If you visualize as the sum of all powers of , inserts the unit (zeroth power) into it, and inserts the sum of non-zero powers. The advantage of this result is that we can concentrate on studying the simpler problem of free -algebras rather than the problem of initial algebras for the more complex list functor. Here’s some useful intuition behind -algebras. Think of the functor as a means of forming formal expressions. These are very simple expressions: you take a variable and pair it (using the tensor product) with . To define an algebra for this functor you pick a particular type for your variable (i.e., the carrier object) and a recipe for evaluating any expression of type (i.e., the structure map). Define another algebra with the carrier the set of real numbers, and the structure map multiplication by a number. There is an algebra morphism from vecAlg to mulAlg, which takes a vector and maps it to its length. This is an algebra morphism, because it doesn’t matter if you first calculate the length of a vector and then multiply it by a, or first multiply the vector by a and then calculate its length (modulo floating-point rounding). A free algebra has, as its carrier, the set of all possible expressions, and an evaluator that tells you how to convert a functor-ful of such expressions to another valid expression. A good analogy is to think of the functor as defining a grammar (as in BNF grammar) and a free algebra as a language generated by this grammar. The universal mapping injects the set of generators into the set of expressions (here, it would be the leftmost injection into the coproduct). This is the unique g induced by our f.
Here are some interesting properties that will help us later: -algebras are closed under multiplication and exponentiation. If is an -algebra, then there are also -algebras with the carriers and , for an arbitrary object . Let’s find their structure maps. which we can simply take as the lifting of by the tensor product: . to implement the (uncurried) structure map. which follows directly from hom-adjunction acting on carriers. If is is the free -algebra generated by , then is the free -algebra generated by with the universal map given by . We want to show that there is a unique that closes the diagram in Fig. 9. The intuition is that the morphism selects an element of the internal hom that corresponds to the original morphism . Uncurying this gives us the sought after . follows from pasting together two diagrams that define the relevant hom-adjunctions in Fig 11 (c.f., Fig. 1). Fig. 11. The diagram defining the currying of both and . 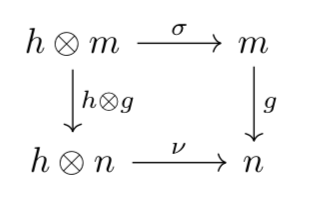 This is the pasting together of two diagrams that define the universal property of the internal hom , one for the object and one for the object . (modulo isomorphism between and ). We’ll use this property later. Notice the order reversal in function application. The list that is the argument to g is converted to a series of applications of nu, with list elements in reverse order. We first apply nu (b, -) and then nu (a, -). This reversal is crucial to implementing list concatenation, where nu will prepend elements of the first list to the second list. We’ll see this in the second installment of this blog post. G.M. Kelly, A Unified Treatment of Transfinite Constructions for Free Algebras, Free Monoids, Colimits, Associated Sheaves, and so On. Bulletin of the Australian Mathematical Society, vol. 22, no. 01, 1980, p. 1.